Confession time. I have an addiction to scarves. Alongside biscuits and stationery, they are just something I can't say no to. I have found a BEAUTIFUL collection of them on Gabrielle Vary Knitwear (i literally need them all) and I will be visiting designer Gabrielle at the fair for sure. 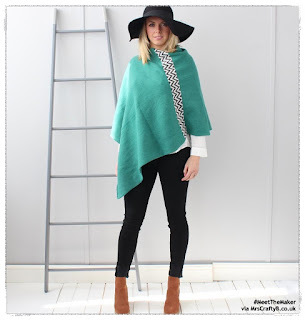 Gabrielle, it's fab to have you on the blog. Can we start off with a little about you? Nestled next to the South downs on the outskirts of Brighton, I design, make and finish beautiful knitwear from my studio in Sussex with an emphasis on quality and design. Your designs are fabulous. I am totally drawn to your style and I have my heart set on one of your scarves! You're sharing something else today though. Tell us a bit about it. 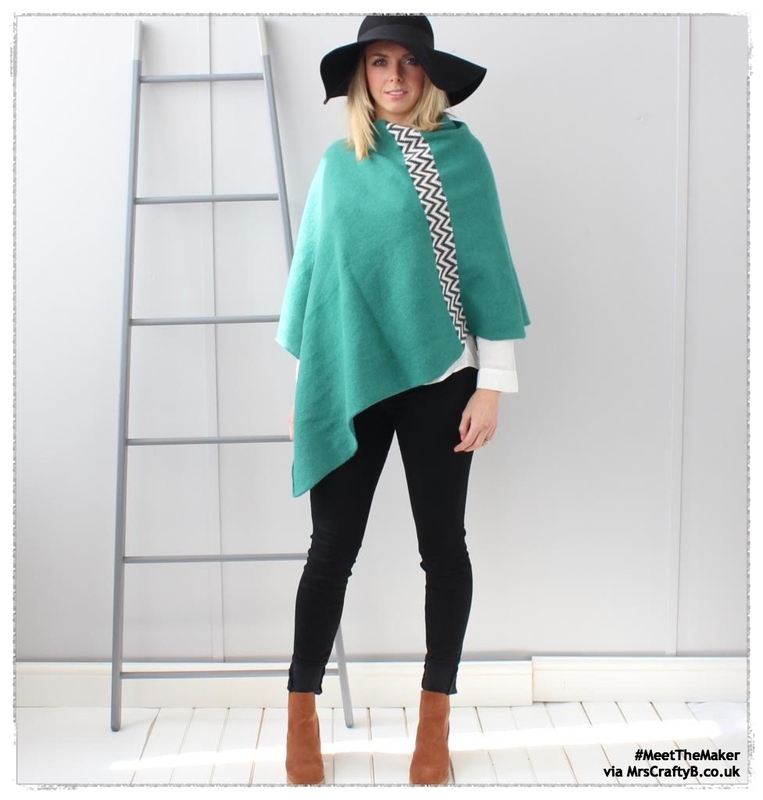 This is one of my favourite jade green ponchos featuring a white and grey chevron detail. Like all my knitted products it is made in my little studio on one of my vintage knitting machines. Each item is made using the finest British spun lambswool. I don't know what by favourite thing is; how it is made, what it is made with or the gorgeous design! How and when did you learn to create items in this way? I studied in Winchester School of Art for 3 years from 2007 learning how to use domestic and industrial knitting machines as well as other crafts around knitted textiles. From there I worked at various knitting companies learning new skills as I went along. I mainly work on domestic machines now however I’m still learning everyday. I love constantly building on my skill set. When did you turn your creative skills into a business? My final collection at University was made up of cushions, throws, wraps and hot water bottle covers, once I had my graduation show people started to ask if they could buy pieces from my final collection so I started selling off pieces and creating new pieces to sell. I then started to take my collection to craft fairs and shows and eventually setting up a little shop on Etsy. The demand kept growing so I kept building the business step by step until two years ago I was able to stop my other jobs and focus on the business full time. I can certainly see why there is a demand for your product Gabrielle. So what inspires and motivates you? My inspiration can come from the most unusual places. It can be fashion magazines or a walk in the country, it can be seeing an outfit on someone or a splash of colour on the side of a building. I love constantly taking photo’s of inspiration to use at a later date when needed. My studio walls are full of random shots I’ve taken or found on Pinterest of patches of colour combinations or pattern choices. The weirder the better! Fabulous. Have you been to the Handmade Fair before? This will be my second year exhibiting at the handmade fair, last year was great and there was such a buzz about the fair. I’d say come early as last year the tents got very busy, it’s such a great event with so many lovely stands! Make sure you pop to the food hall too, yum! I am getting more and more excited with each interview I read from you guys. It just sounds so exciting. What are you most looking forward to this year. I really want to head to a talk this year as I was so busy last year I wasn’t able to. The Liz Earle talk looks great. I also can’t wait to see what other lovely stands they have again this year to start off my Christmas Shopping! Oh and of course meeting the lovely Kirsty! I am hoping to catch Kirsty for a cuppa myself! Ha ha! Where will we find you at the fair? At stand W19. I’ll be selling my beautiful handmade knitwear- scarves, ponchos, cardigans and cushions as well as lots of cute knitted hearts, hotties and mini lavender cushions. I am totally on the scarves (can you tell?). I keep going to your website to try and decide which one I want! What will you be up to between now and fair? Knitting away ready or the fairs ahead, creating new poncho and cardi colour ways as well as trying to get a holiday in before the hectic Christmas rush starts! Oh Christmas! *sigh* Time goes too quickly. Right a quick fire round before you go. I don’t think I really have one although I do admire so many small business owners who have turned their passion into a business. Stitch Kits London, Pinkster Gin and Bad Brownie. Eating and drinking, sunshine and walks in the country. Colourful, lively, busy, beautiful, fun! I had to try so hard not to respond to your quick fires Gabrielle but I am saying that Bad Brownie is on my radar! Thanks so much for taking time to share with us and we will see you in September!